Nice work Steve and Jo! Excellent Production! One question, what did he keep asking you to keep your hands clear of? It didn't look like you moved your hands at all. Nice work Steve. Great BLOG too. How do you get these guys to give you a ride? The hands-clear had mostly to do with the controls. Just making sure that I didn't interfere in the back with what he was doing in the front. I watched your T-38 ride during my commuter rail ride home to the 'burbs last week. That slight side-to-side jostle of the rail car seemed to sync perfectly with the similar bumps you were getting in the back of that amazing airplane. For a few minutes, I was right there with you. Thanks, and keep up the great work! We would like to thank you for maintaining such a reputable blog. We know that it takes time, effort and commitment to keep such a blog and as such, we have added your blog as one of the top Aviation blogs. 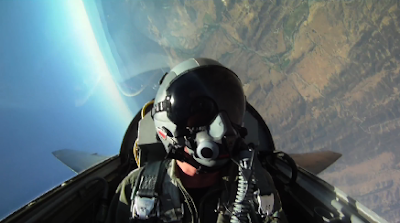 Getting to fly in T-38 on multiple occasions was probably the most memorable times of my Air Force carreer. It’s an amazing machine. I’m SSgt Howe, I was the one who fit you to your fight gear. I was medically retired shortly after your visit. Great video by the way and thanks again for the coin.